Q: What made you decide to become a performer? A: I used to daydream of running away and joining the circus. This got me through essays at University and I did help set up a juggling society while I was there but it was just a daydream. I didn't run away and join the circus. I ran away and the circus joined me! I had worked in London with adults with learning difficulties for over ten years and gradually took on more and more management responsibilities. This really didn't suit me and eventually I decided that enough was enough. I left my job and went to Thailand. I travelled out with a friend to Bangkok and by chance we bumped into a mutual friend who was going, with a group of performers, to the North of Thailand to provide circus entertainment for Burmese refugee kids. My friend Em had plans already but I didn't, so I joined this group and went with them. After this, it wasn't really one big decision for me to become a performer, rather a gradual process as I began to do more and more things that appealed to me and attracted me. Over time, I met more people who had circus based skills, I was able to use the skills I had and learn others in order to make a living. It was the thing I did that I enjoyed most and it expanded to become the profession I now have. 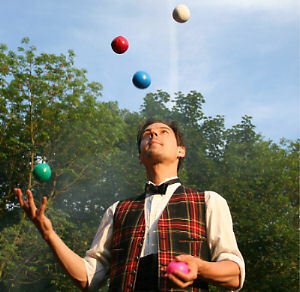 A: I revered jugglers when juggling was a skill seen only in street performance or at a circus. This was in the early eighties, many years before the juggling boom of corporate stress relief and school or community workshops. I got into it as a hobby, an interest, as something a bit different, something I got quite good at. Q: What were your early influences? 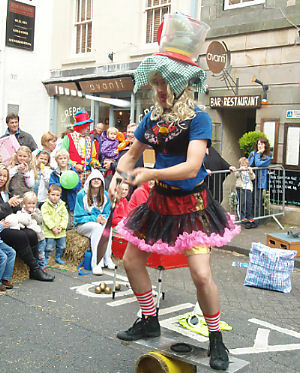 A: Street performers were the main influence. I still think there is something very honest about this form of entertainment. It's even better than a money-back guarantee as you don't have to hand your money over until after you have seen what you're getting. Q: What were your first tricks? A: My first trick was to make it sound like I was playing snooker when I was actually practising juggling with snooker balls. I am still surprised I learned to juggle with snooker balls without smashing any windows! There are easier ways to learn to juggle!! Q: What are your favourite tricks and why? A: I like the 'invisible string' trick – it's a three ball trick where it appears that two balls are connected invisibly because they move at the same speed and direction. I always had an attraction to fire and I still love fire. Fire juggling, fire whips, fire breathing, fire eating … it's smelly, messy and dirty but it still holds an elemental appeal to me. Q: Do you juggle anything really unusual? A: I don't know if this counts but I do juggle fire, underwater, with a man-eating shark. This involves juggling real fire torches with a fish tank on my head with water in it and with George the Man-eating Shark hand-puppet inside the tank. To make it a little more difficult, I do this balancing on a plank on top of a cylinder. This is not easy - and technically I am indeed underwater. For protection from the man eating shark, I wear a tutu, bra, lipstick and a gorgeous blonde wig. I've not been attacked yet! I also channel the love and positivity of a crowd to see through five metres of solid metal. To prove I can do this I juggle three balls on the the side of the metal. The five meters of metal is a roll of kitchen foil I wrap around my head which it is impossible to see through. The skill here is to be able to juggle without seeing what I'm doing. Fortunately, this is a secret that has never been divulged to anyone !! Q: What are the key elements in health and fitness for what you do? A: There is a mixture of stamina, flexibility and strength in what I do though the benefits are often in terms of relaxation and co-ordination. Q: What about the 'jester' part of your act? A: I am often irreverent, mischievous and playful. I am often a grumpy jester. I react to whatever people are doing. I have been known to ask people to marry me, to ask if I can look after someone's handbag and run off with it. Cameras, umbrellas … at a beauty promotion, I kept on trying to put perfume samples into people's bags. It reaffirmed my faith in human beings as everyone was insistent that I put them back on the shelves! 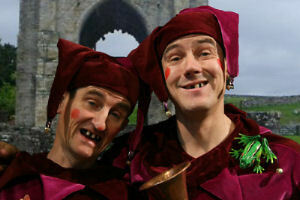 Being a jester is like being given one present after another. Even if someone does nothing, I assume someone has offered me something and I accept their offer and I go with it. If someone stands still, I can join them in their queue, if someone yawns, that's the offer, if I see a kid with their hands inside their coat to stay warm, I am curious that they haven't got any hands – and then when they show me them, I run away petrified. I come back when the hands are gone again, only to repeat this over and over. Disappearance and reappearance can be fascinating. It is not planned, it is new every time. Some themes reappear but each interaction is different. What one person enjoys may not fit for another. Q: What are the opportunities for performance today? A: I do a mixture of corporate bookings, community events, school and adult workshops including team building events, street shows and theatre pieces. I juggle, eat fire, walk on stilts, unicycle, walk a tightwire and teach these things. Q: Do you travel overseas with your act? A: I did Santa Cruz recently – a boat trip to see Father Christmas across Lake Windermere! Q: What is the most unusual 'gig' you have ever done? A: It's normal for me to do things like eating fire or being a nine foot Christmas tree dancing to a jazz band or walking round wearing flippers in an antique bathing costume asking people where the sea is in Birmingham or being a dalmatian dog weeing up trees and chasing policemen or juggling knives over insurance brokers. I'm probably not the best person to answer this question! Q: Which venue or location have you performed in that stands out most in your memory? A: To perform at Covent Garden has been an ambition realised. The Northern Green Gathering Fire Show was instrumental in me pursuing performing as a career as it was the best thing I did that year. There are many others; Glastonbury Festival, the British and Israeli Juggling Conventions. 'The Tomb of Delights' with Jamboree Arts was fantastic. I was the compere Dr Dai De'ath. Having brought a sarcophagus back from Egypt, I summoned up the acts from inside the tomb. One of the games was 'Who's the mummy ?' where three pairs of contestants have four minutes and one toilet roll to dress one person up as an Egyptian mummy. I ended up with my parents on stage as contestants with my mother dressing my father up as a mummy. The audience loved seeing this and the applause for them was phenomenal. I was overjoyed to share this with them. Q: Do you do 'bounce juggling'? A: I can bounce juggle but it is suited to a stage performance as it requires a high quality solid surface to work with. Marble slabs are heavy and not easy to sling over your shoulder after a street show. You also have to be really good because if you miss a ball, they can go a long way from where you are standing. Q: Do you do 'contact juggling'? A: I do some staff manipulation and ball manipulation. I also like club swinging which is in some ways the forerunner and shares similarities with poi. Q: What you do you think of juggling notation and is this an important development? A: Juggling is a curious interest that attracts many types of people. The development of site swap notation led juggling deeper into the arena of mathematics and mathematicians than ever before. Juggling has now been brought back towards the arena of performing with jugglers having a sophisticated way to stimulate ideas and juggling patterns. Some technically complex patterns are not particularly pleasing to watch but are a significant physical challenge and some things visually are beautiful and not technically difficult but may not have been picked up without using site swap notation. 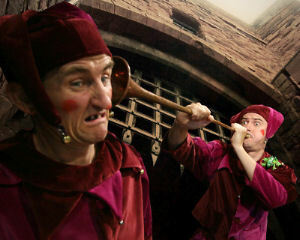 Q: Have you studied the history of juggling / jesting at all? A: I have been to many many workshops and to juggling conventions both in the UK and internationally and have learned a great deal. I have studied with Sean Gandini and Rod Laver for juggling, Keith Johnstone on improvisation, Jonathan Kay and Fraser Hooper for clowning among many others. Q: So what are the main differences in the art between medieval times and today? A: I've no idea! Unfortunately, I wasn't there in medieval times and despite my last answer, I haven't actually studied the history of jesting. If I had been there in medieval times though, history would be very different. All photographs used in this page are copyright David Ford - used by kind permission.